Submitted 2 weeks 3 days ago by feeds_user. 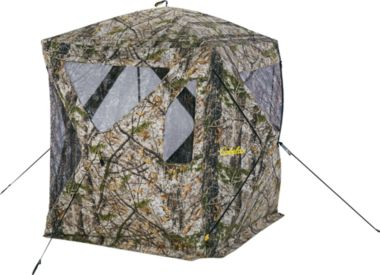 Cabela's The Species XL Ground Blind Large enough with plenty of visibility for you and a hunting partner Extra-large diamond-shaped windows at two corners Adjustable 180° windows provide maximum visibility Hook-and-MOLLE window system eliminates the need for zippers All windows include repaceable shoot-through mesh panels Cabela's The Species XL Ground Blind provides plenty of space and shoot-through windows to keep you and a hunting buddy concealed in the heat of your hunt. Extra-large diamond-shaped windows in two corners and wide 180° panoramic windows between them maximize visibility and shooting areas. Rugged 7-oz. cotton/polyester construction is polyurethane coated for moisture resistance. Hook-and-MOLLE system at each window for zipper- and Velcro®-free silence. Replaceable shoot-through mesh coverings at each window. Reflective door details. Integrated brush loops let you add to the concealment. Includes all necessary stakes, mesh and convenient carry bag. 79"L x 79"W x 79.25"H. Footprint: 62" x 62". Wt: 25 lbs. Camo pattern: Cabela's Zonz™ Woodlands. Cancer and Reproductive Harm- www.P65Warnings.ca.gov.